I saw a recipe a while ago that called for lavender and thought to myself well wouldn’t it be lovely to make something with lavender? So I went to my favorite spice shop and bought some lavender. And then I couldn’t remember where that recipe was from or what it was for…this is kind of typical in my world, have to say. So I found a whole new recipe that would put my lavender to good use – and it did. 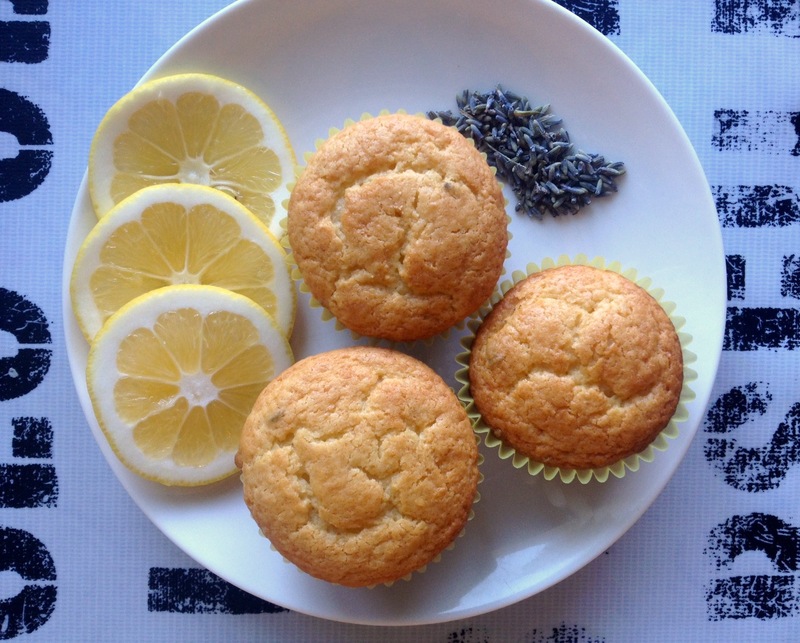 These are lemon lavender muffins that are made slightly less sinful with the use of Greek yogurt and olive oil instead of butter. There is still a whole cup of sugar and the truth is, they were absolutely perfect topped off with some cream cheese frosting (store-bought, I didn’t have the energy to make my own) so let’s not call them sinless but decidedly less sinful. And did I mention there’s lavender? It’s subtle so you can go ahead and be generous with it, no one will notice – not even your kids. And you can say you bake with lavender now. 2. Line a muffin pan with muffin liners. 3. In a large bowl mix sugar and olive oil. 5. Add the yogurt, lemon zest, lemon juice and lavender and mix well. 6. In another bowl sift flour with baking powder. 7. Add the flour ½ a cup at a time to the batter while mixing. 8. Fill the muffin cups 2/3 full. 9. Bake for 25-30 minutes, until an inserted toothpick comes out clean (mine took 25, any longer and they would have been too dry).